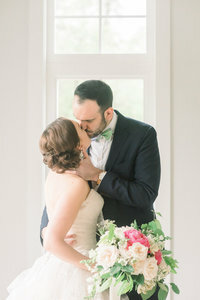 Jessica and Dan’s romantic Stillwell House wedding photos has our heart going pitter patter today. We loved so many aspects of this wedding, from Jessica’s beautiful dress and the special ring she wore that belonged to her grandmother, to the gorgeous Stillwell House and Garden venue, and perhaps our favorite- all of their amazing family and friends. The beautiful thing about what we do is being able to meet so many out-of-town guests that we would not have had the opportunity to otherwise meet! And 90% of Jessica and Dan’s wedding guests were from out-of-town! The day started with us arriving at Jessica and Dan’s getting ready locations. Jessica chose to rent a unique Airbnb located in downtown Tucson to get ready in because she thought it would make for some fun, picturesque photos. She was not wrong! It was such a great spot to capture her bridal details and all those fun, quiet, and intimate moments as she got ready with her mom and bridesmaids before she walked down the aisle. Their First Look took place not far from the Stillwell House and Gardens, on top of ‘A’ Mountain. A first for us when it comes to doing a First Look there, but we loved the way it overlooked the city and provided a beautiful desert backdrop for their photos. It carried the desert theme in their wedding and the desert experience that Jessica and Dan hoped their guests would have during their stay here in the Southwest. And Jessica was of course gorgeous and radiant, as always, during that private time that they enjoyed together. There were so many moments that, while going through Jessica and Dan’s wedding images, we quietly smiled to ourselves. Jessica and Dan are such a sweet couple and if it’s one thing we know, it’s that they’re both kind and beautiful human beings, and it’s been a pleasure getting to know them both. And what was continually reaffirmed that night of the wedding was how much happiness they have brought into each other’s lives. And how great of a support system they are for one another. From moving here together with nothing but a truckful of their belongings to pursue new careers, to renovating their new home all while planning a wedding, they have been each other’s pillar of strength. What we also learned is that Dan is unaffected by change. And during life’s often times wild ride, Dan is Jessica’s rock. He’s her comfort and he’s that shoulder she leans on. It was in that moment, surrounded by their family and friends, that we realized that Jessica and Dan are wonderful individually but even better together because they have a great foundation that helps to build a beautiful marriage. Jessica and Dan, we have loved the time we’ve gotten to spend with you, and your family and friends. It’s been both a pleasure and an honor to have joined you in this journey. And when you look back on these photos, we hope you see yourselves as the rest of us see you: two beautiful people, in love, and at the beginning of their life together. 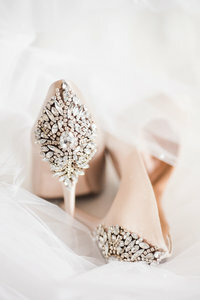 Enjoy these Stillwell House and Gardens wedding photos! It was a joy for us to capture them! You can also read about Jessica and Dan’s engagement story here.